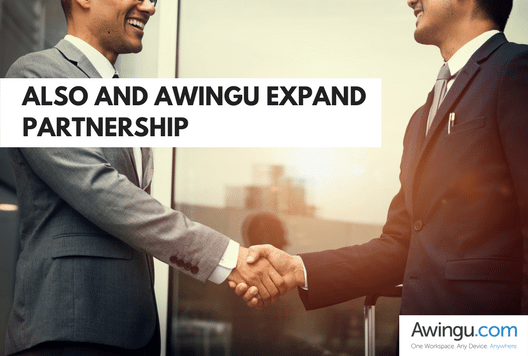 ALSO and Awingu are building on their existing partnership to expand web-based mobility solutions into reseller channels in Sweden, Norway, Denmark, Finland, Poland, Netherlands and the Baltics via the ALSO Cloud Marketplace. With Awingu’s software, ALSO’s resellers can help their customers to access company files and applications from one secure online workspace on any device – with nothing more than an HTML5 browser. Awingu uses the power of the latest web technology to mobilize all company applications regardless of where they physically reside, whether in the cloud or on premise. It has the advantage of compatibility with all cloud services and pairs perfectly with ALSO’s strong portfolio of advanced mobility solutions. Today’s office environment typically combines SaaS, Web, Windows Server, Windows Desktop and older legacy applications. With Awingu – a “Gartner Cool Vendor in Unified Workspaces 2017” – companies can run all office applications on a server using RDP without any need to reprogram, resulting in significant cost savings. Now available in the ALSO Cloud Marketplace.